No, we do not think that former Federal Reserve Chairman Paul Volcker is a Jew. According to reporter Roni Sofer of the usually reliable Israeli source YNet, he is a Jew. However this is disputed by credible evidence. The 2004 biography by Joseph B. Treaster, Paul Volcker: The Making of a Financial Legend, says Volcker attended a Lutheran church on Sundays with his mother, while his father went to an Episcopalian church. Volcker is a native son of Teaneck New Jersey and a graduate of Teaneck High School. His father was the township's first Municipal manager. Volcker was appointed Chairman of the Federal Reserve in August 1979 by President Jimmy Carter and reappointed in 1983 by President Ronald Reagan. Volcker served on the Obama economic team. WSJ reports that his influence was substantial, "At least for the day, the most powerful man in the U.S. financial industry and for equities markets is 82 years old, a man who ended his leadership of the Federal Reserve more than 20 years ago." For those Orthodox Jews who believe that browsing on the Internet leads to sin, here is an Ashamnu A to Z acrostic to recite during the season of repentance for those Web actions that might lead one to sin. In light of the barbaric murder of Americans in Libya, a very good friend reminded us of our concern on this blog and in our op eds for the concept of lex talionis - often associate with the biblical notion of an eye for an eye. We wrote in the past about how that biblical legal notion was a great leap forward in moral compensation thinking in the ancient world of the middle east, even though it seems to many of us now to be a brutal principle of justice. To be clear, we say now that those who murder and claim it is a response to a video will have to be classed with the most primitive of the pre-biblical tribes. See one newspaper op-ed that we wrote about this in 2005 - here. Shani Boianjiu writes in the Times about a sad Secular - Orthodox situation in the Israeli Army. 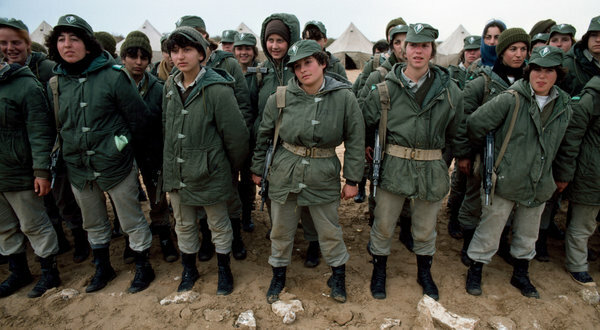 Some Orthodox men resist working with Women soldiers who are training them. It makes me sad to read that Orthodox men can act so strangely. I'm sad because it means they were taught the wrong things about what God wants them to do. See: What Happens When the Two Israels Meet. I told a good Republican friend I was having lunch with yesterday that I can't talk politics with him this time around. I explained that the level of personal attacks that I was seeing directed at Obama and at his supporters was simply unacceptable. Rhetoric coming from that side was tilting too far away from facts, policies and substance and towards sarcasm, cynicism, mockery and slander. And so, end of discussion. The choice is to vote for Obama, for facts, policies and substance, or for Romney, for sarcasm, cynicism, mockery and slander. 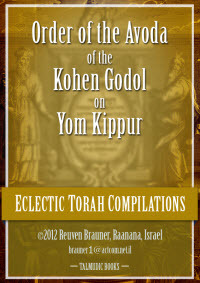 A summary of the major activities of the Kohen Godol on Yom Kippur in chronological order, with reference sources. It includes a small diagram of the Temple, an explanation of the symbolisms of the Avoda and other elements and events related to the Temple and Temple service, an "Atonement" chart, and some brief information on the differences between the Amitz Coah and Atoh Conantoh versions of the Avoda as recited during the Yom Kippur Mussaf service. Tzvee Zahavy adds, "Rav Soloveitchik said that the Avodah was one of his favorite tefillot. One of my favorites as well. It is a quintessential expression of priestly archetypal prayer within our synagogue devotion. By knowing how the ancient priests sought atonement we may find another path to our own repentance." Hat tip to Susan A.
Aaron Reichel Reviews Tzvee Zahavy, "God's Favorite Prayers"
A review by Aaron Reichel of our book, "God's Favorite Prayers," has appeared in the current issue of the Review of Rabbinic Judaism. Tzvee Zahavy, God’s Favorite Prayers (Talmudic Books, Teaneck, New Jersey, 2011), 157 pp. Everything you need to know about the Jewish New Year. Perfect for the High Holidays: Kindle edition of the Talmud Rosh Hashanah. Price: 99 cents. The New Moon of the Jewish seventh month is a Festival of special solemnity known as Rosh Hashanah, New Year's Day. This is the eighth treatise of the Babylonian Talmud order Mo'ed. It is composed of four chapters with rules for proclaiming New Moon, for the New Year liturgy and the blowing of the shofar (trumpet). It contains (1) the most important rules concerning the calendar year together with a description of the inauguration of the months by the nasi and ab bet din; (2) laws on the form and use of the shofar and on the service during the Rosh ha-Shanah feast. How much are synagogue dues? This time of year Jews are deciding whether to join a synagogue for the high holidays. One obvious question to ask about this process is how much are the membership dues? jweekly.com covered this issue in a detailed article, "Dues and don’ts: Shuls try different membership models." And our friend Robert White, lawyer and blogger, critiqued the article. What is the opposite of freedom of speech? Blasphemy law. In the NYTimes.com Chloe Breyer discusses the negative impact of those laws. She says, "...Beyond bad doctrine, blasphemy codes can be legally dangerous. A 2012 report by Human Rights First — “Blasphemy Laws Exposed: The Consequences of Criminalizing ‘Defamation of Religions”’ [pdf] — outlines several types of problems with the application of blasphemy laws worldwide. In addition to stifling dissent and discussion in the public sphere, such laws can actually spark assaults, murders and mob outbreaks..."
Our sister and science editor of the JStandard, Miryam Wahrman, wrote an extensive and insightful article about hand-washing in Judaism and science. In JStandard Zalman Alpert analyzes Modern Orthodoxy in Teaneck. He muses in the interview article, "Speaking of synagogues, Alpert continues, Teaneck’s dozen modern Orthodox shuls, and a growing number in other Bergen County communities such as Bergenfield, Englewood, and Fair Lawn, is also a new phenomenon in American Orthodoxy." We wonder how many modern Orthodox Jews live in our town. Twelve synagogues, so 12,000 families? More? Fewer? Even in the best estimate case, it seems the impact of modern Orthodoxy rests not in quantity but in quality.